Join us at La Galería Café, in the center of Monterrey for our next InterNations Official Event! This is a venue right in the middle of Barrio Antiguo. And the area is full of bars, clubs, markets and night life. 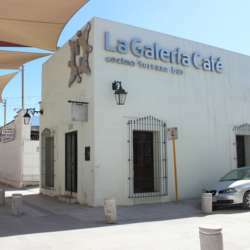 We will be at the terrace of La Galeria Café, from where we can have a very nice view of Monterrey, to get to the terrace there is a narrow and steep spiral stairs, no elevator, sorry. Some walking to get to this area is expected, this is a crowed place, so it may be possible that people that arrive late may have to be standing up. Please don’t forget to register for this event by clicking the “Attend” button. If you have registered, but then are not able to attend, please take the time to unregister, this makes planning possible for us. Thank you! Guest List closes the day of the event at 16:00.